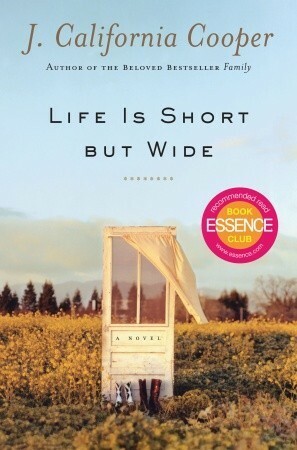 J. California Cooper's Life is Short But Wide is not a book I knew anything about before I found it while scrolling through my library's digital library collection. I'm surprised by this fact; I read Life is Short but Wide soon after reading O, Pioneers! and the two felt very similar to me. They are both about religious women struggling to make ends meet in the west. But while Willa Cather focused on the Scandinavian immigrant experience, J. California Cooper focused on the Black American experience. I enjoyed both authors because they gave completely different perspectives on similar experiences. Cather's story focused on life during the earlier part of the century; Cooper starts her story at the beginning of the century and then continues it through the early part of the 21st century. Life is Short But Wide is a pretty awesome title. I feel like this is probably a truism from way back in the day that I was unaware of, but I love this phrase and want to use it as Aarti's Philosophical Quote on Life. Once you get past the title, you get to the actual story. It's one of those multi-generational sagas that starts with one generation of graduates from the school of hard-knocks and continues on over the next three generations or so. I am never sure how to provide plot summaries of books like this, so suffice it to say that each generation of characters we follow is interesting and different, but it's very hard to keep them straight in your head. I really enjoyed this book because I think that westward expansion and life on the frontier in American history have been completely white-washed. Many authors ignore the Native Americans that lived there before the American settlers arrived, and many people pretend that only white settlers went west when many more people made the trek. J. California Cooper brings that American history to life in ways that Willa Cather didn't even try to. Here are African-Americans who are frightened of white people, and Native Americans who are normal, not spiritual alcoholics. This fact in and of itself makes me love Cooper as an author. Her skill with writing about people's feelings, which is hard to do without sounding very corny or lame, also really impresses me. And a major plot point of this book is about two people who are past middle age falling in love with each other, and I think it's glorious that she makes two elderly people the subject of a romance. So many points in Cooper's favor! I plan to read more by her. This book was not perfect. It felt really preachy, really often. There was a conversation between one female character and a younger female character that felt more like a list of To Dos from a graduation speech than anything else. There was also a section towards the end in which one of the characters talks about Jehovah's witnesses, and tells one of his friends (and all of us readers) just why Jehovah's witnesses are the best. And there are many comments about the way people dress now, politics, and so much more. This would have been fine if it was done in the service of giving us more information about a character's personality and point of view, but it usually felt like Cooper's Philosophy on Life was coming out through the mouthpiece of her characters, and it got pretty annoying. It's not that fun to read monologues about religion in a novel. At least, not for me. The book also took FOREVER to get to the end. There was a lot that happened, but from at least halfway through, we know that one character, Herman, wants a family and "something that is mine, all mine." And then there is another character whose name just so happens to be Mine. And yet, we literally (and I do not exaggerate) spend THIRTY YEARS waiting for these two to realize they should get together. I mean, come on. No wonder they are practically septuagenarians by the time their romance starts! Also annoying - there was a voiceover narrator who had zero part in the story. This always annoys me. What is the point of creating a narrator with a personality and a point of view on events and all the rest, and then do nothing with that character? Not even give us her name? I don't get it. I just listed a lot of things I disliked and glossed over the parts of the book I did like. It was a somewhat odd book, but I did enjoy it, and I plan to read more by Cooper. However, if there is more preaching about how we should all become Jehovah's Witnesses and how women should never love anyone more than they are loved themselves in her other books, then maybe I will not read a lot more by her. I've always wanted to read something by J. California Cooper but I'll pass this one up. It sounds like if the book had been less preachy and shorter, it would've been a winner. Maybe we SHOULD all become Jehovah's Witnesses. Ever thought of that? Eh? Eh? Hmmmmm.... Hmmm. I LOVE the title of the book, because SO TRUE, but Jehovah's Witnesses? REALLY? I can't quite deal with that. So maybe I'll just write 'life is short but wide' on a post-it, and leave it at that.